“Rez, you’re going to Banda Neira, is that okay?” said Mbak Nila to me last month. Banda Neira, if we google, leads to the news reporting the split of a Indonesian Duo under the same name. We need to scroll down the page, and even go to the next page to find out where Banda Neira is. It is actually an archipelago in the southeast Ambon. It takes around 6 hours to get there by speedboat from Tulehu Port, Ambon. An alternative mode is by a Pelni boat, travelling once in two weeks and taking 15 hours to get there. 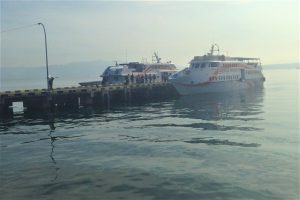 The available Pelni boats are: Ngapulo, Tidar and Pangrango. Another alternative is by plane, yet when I was in Banda, the plane was not operating, so boat came up as the only option left to reach Banda Neira. The speedboat is available twice in a week. I was lucky that the weather was very friendly, I had a seat in the boat and watched movies, Mission Impossible 1 until Mission Impossible 4, until I finally saw land from the window. A few years ago, when we entered Cengkareng Airport, we were greeted by Soekarno & Hatta, yet in Banda Neira Port, we are greeted by Hatta & Sjahrir, not in the form of statues but a grand mosque across the port which is named after the two founding fathers who were once exiled in this island. Before continuing the journey, there is one thing that triggered my curiosity: Which one is true, Banda Neira or Banda Naira? Is it with an E or A? After having talks with the locals, I found out that the correct spelling is Banda Naira, while Banda Neira is how the Dutch used to pronounce the name. 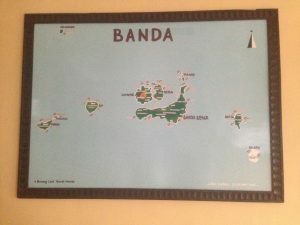 However, it is not a big problem for people here as they are used to mentioning “Banda” only, without “Naira”. However, this story will use the correct spelling, Banda Naira. 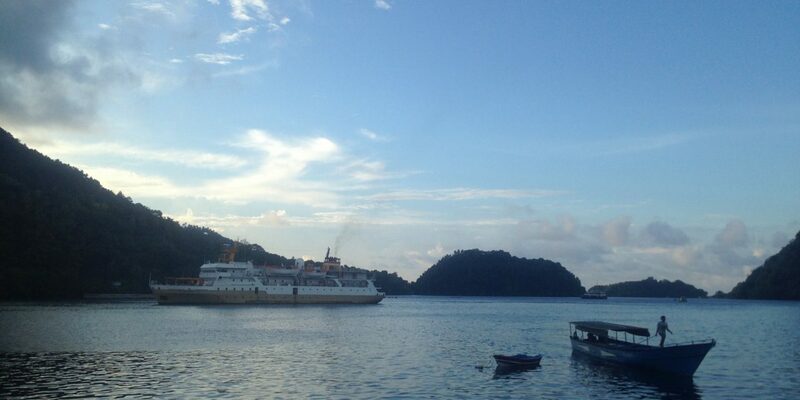 There are 3 main islands in Banda Naira, namely Naira Island, Banda Besar Island and Gunung Api Island. The three are located close to each other. There are also other small islands here: Hatta Island, Skaru Island, Ay Island, Rhun Island, Nailaka Island and Manukan Island. Naira Island is the downtown of Banda Naira. Port, airport, market, government buildings are located here. We can also find Dutch heritage here, such as colonial-styled grand buildings. There is no public transportation in Naira Island, and private cars are very few as people use motorbike or walk on foot. Walking around Naira Island is far from exhausting as there is not many vehicles along the road, the weather is not too hot and the air is fresh. As if this isn’t enough, the road offers views that takes us back to the 1800s when nutmeg was the most searched item. After a few days being here, I realized that Naira people are not like other Eastern Indonesian people. 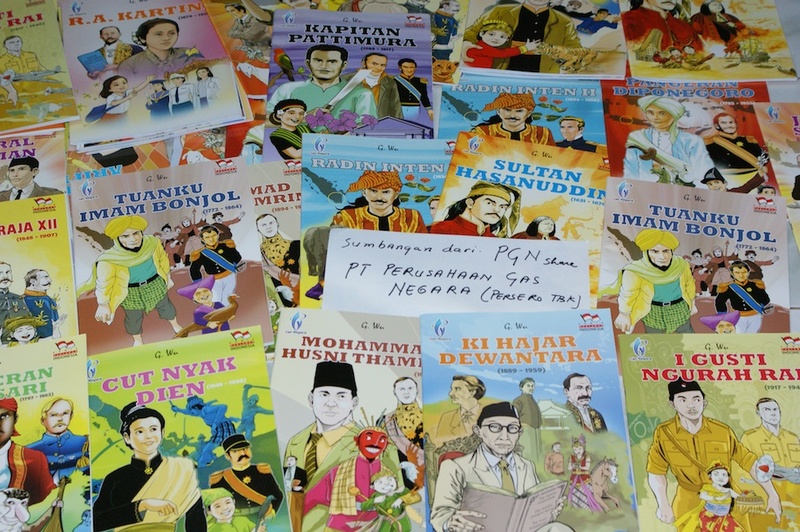 Physically, they look like Malay and Javanese. 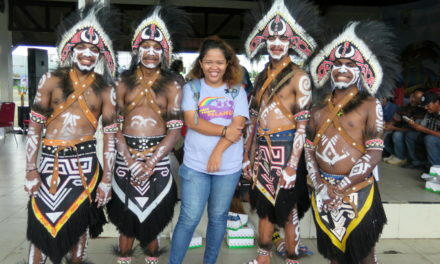 After talking to Kak Ari, my host, I found out that the native Banda were expelled from the island when the Dutch came. The Dutch later on brought workers from Java and Buton Island to work at nutmeg plantation; thus, the majority in Naira Island look like Malay. 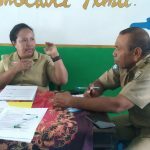 However, Maluku local language and culture is still easily found as each kampung has traditional house where traditional ceremony is to be held. I was lucky that I can witness “buka kampung adat” ceremony in which Cakalele was performed. 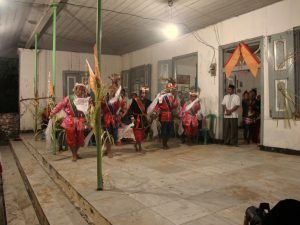 It was a traditional war dance performed by local young men, equipped with traditional costumes, swords, shield, and spear. There are many more interesting events to share here, yet my mission here is to establish Rainbow Reading Gardens library at Naira Island. Therefore, I have to visit a number of primary schools for the selection. Walking around the island did not exhaust me as the view always triggered questions in my head. Is there any old building on that turn? Are there ruins of building at the end of that road? What is that grand building over there? These questions have accompanied me along the way. There are 6 primary schools in Naira Island, five of them are in the southern part while the other is in the north. The southern part of Naira Island is densed and is the downtown. I visited all the schools in the southern Naira while observing the school, library and talking to the principal, teachers about developing a child friendly library. 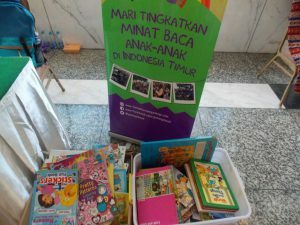 From the survey, SDN 2 Naira was finally selected as our partner school in Naira Island. SDN 2 Naira is located in the middle part of South Naira on Dr. Rehatta road, not far from Belgica Fort, Nassau Fort and Bung Hatta’s House of Seclusion. The school embodies old grand building established in the 1800s. 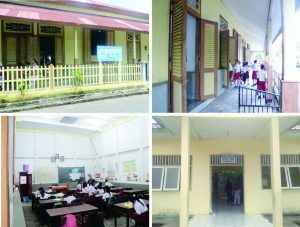 The school used to be a School of the People for the Dutch Noblemen as well as Indonesians. As soon as we stepped our feet on the classroom, we can feel the vintage atmosphere with its high roof and large windows. I no more questioned whether Bung Hatta once taught here during his exile in Banda Naira. 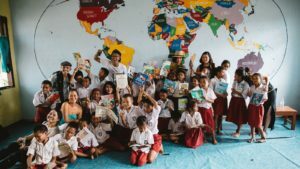 The library at SDN 2 Naira is at the school complex, and the building is not an old one. Similar to other library buildings, this library has one entrance door located in the center between two big pillars. The principal, teachers as well as I could not wait to start the library transformation to make students more eager to come to the library to read and to check out books. How will it look like after Rainbow Reading Gardens is established in SDN 2 Naira? Stay tuned! 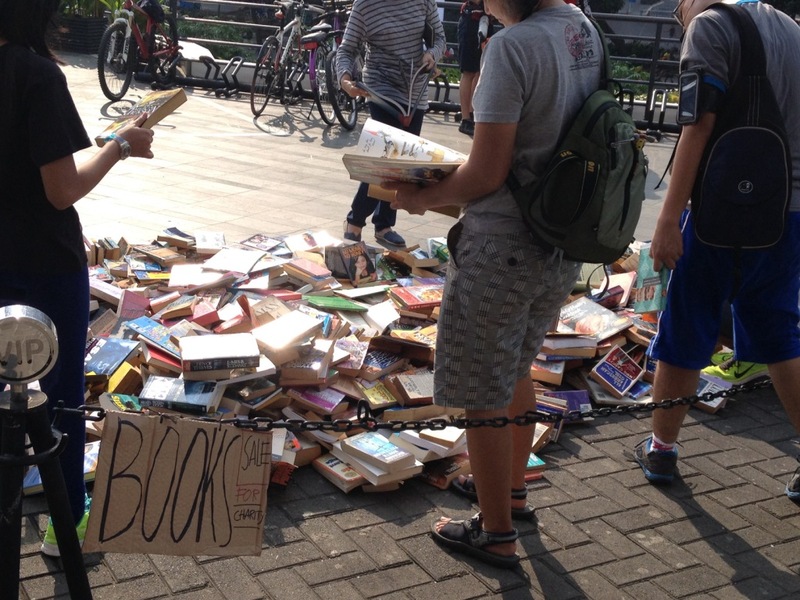 An article about Drive Books, Not Cars was published in The Jakarta Globe. Thank you, The Jakarta Globe!